A meeting was held with the Minister for Education, on Wednesday afternoon, where Mr Merlino was informed about this pressing issue. The meeting was also attended by the Greek Community of Melbourne’s Vice-President and Education Convenor Mr Theo Markos, by Mr Fion Sykiotis, parent, and two representatives of the Italian community. 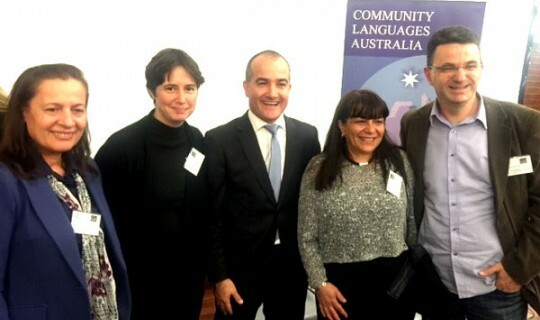 "The Minister showed great interest and was a keen supporter of our requests, underlining the importance of teaching the two languages in the public school system," said Theo Markos after the meeting. Meanwhile, on Tuesday evening, an urgent meeting was held by the NHS’s School Council to discuss the school’s language program and also the School Council’s decision to partner with an independent consultancy firm, SenateSHJ, to seek perspectives from across the school community and present a report with its proposals. Last Thursday, a delegation of the Italian and Greek community met with the Minister Ms Richardson who promised the consultation would be open and fully transparent to all interested communities. Ms Richardson had a meeting with the principal of the school Ms Katie Morris to discuss the issue. Also, on 17 August a meeting was held with Ms Mikakos, who confirmed that she had discussed these issues with the Department of Education. Mr. Markos thanked Ministers Mikakos, D'Ambrosio and Richardson for their help and support and for asking the Minister for Education to help find a solution to this problem.